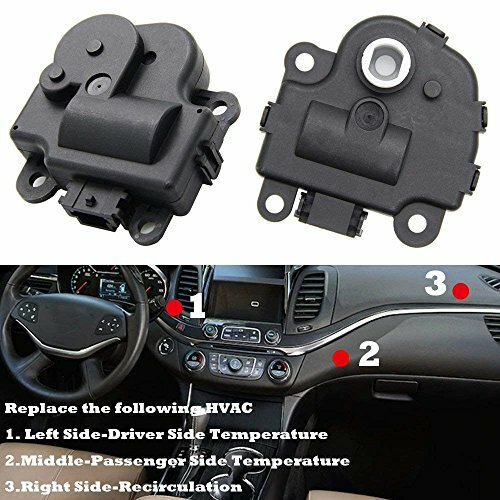 ★ Replace OE# 1573517, 1574122, 15844096, 22754988, 52409974, 15-74122, 604108 - This Aftermarket Air Door Actuator fits Chevy Impala 2004-2014. Please see the detail description to know more informations. ★ Fuction - The air door actuator controls the flow and temperature of air into the interior of the vehicle. ★ This blend door / air door actuator features a redesigned housing to insure it lasts longer than the factory blend door on your Chevy. Also features a more rugged internal circuit board which resists heat, corrosion, and vibration. ★ This air door actuator comes complete with a 18 months warranty. If the part ever fails simply contact us for a replacement.